The holographic computing technology could be a life saver which is known as Nomadeec. It is potentially a life-saving Holo Lens app for paramedics that work with holographic computing technology. EMTs on the scene of a medical emergency can use the device to establish a link with doctors who will help them quickly diagnose and treat the patient. It was possible due to the Microsoft HoloLens technology that ensures hands-free holographic interfaces. It can also display the vital signs of the patients. Also, it prioritizes patients needing the most urgent care. When practitioners need a second opinion from a medical professional, the Nomadeec system can connect them to those medical experts via video conference. The app is available on Apple, Android and Windows smartphone and tablets, allowing connection to all Bluetooth medical devices (such as a non-invasive blood pressure monitor (NIBP), 12/18-lead ECG, stethoscope, a pulse oximeter, spirometer, glucometer, thermometer, and ultrasound), API with other Medical softs, and Patient Care Record (PCR). It was basically developed by French company known as Exelus that unveiled at CES 2018. 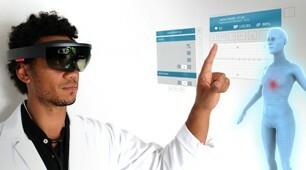 It leverages the gesture-based commands of the HoloLens to give practitioners access to customizable modules for patient assessments, clinical exams, and patient profiles. The solution emerges at the nexus of two growing industries including telemedicine industry and augmented reality industry.